Late last year, Play ‘n Go promised a raft of new games would debut in 2019. Now, it seems, the casino software provider is starting to deliver on their word. This week, the first of these new releases made its debut at online casinos. The highly volatile Raging Rex can now be played. This new Play ‘n Go slot is not a conventional dinosaur-themed game, though. In appearance, it may look like any other in its genre, but there is undoubtedly nothing prehistoric or commonplace about the special features the newly launched slot has to offer. The famous Tyrannosaurus Rex stars as the central character of this game, just like its title suggests. Known as Raging Rex, tyrant lizard shares the stage with other well-known dinosaurs, widely popularised by such movies as Jurassic Park. These include fantastical-looking Velociraptor and Dilophosaurus symbols, as well as more realistic interpretations of Triceratops and Parasaurolophus. The king of the dinosaurs appears as a wild symbol. This T-Rex is capable of covering entire reels, and when it does so, a Rampage Bonus comes into play. This can see the Tyrannosaur storm his way across the reels from the reel it first appears on, to the leftmost reel, churning out re-spins spins on this 6-reel, 4,096-line game as it goes. Raging Rex is also equipped with a few other features. Whenever enough scatters appear on the reels, a free spin bonus can be triggered. This bonus promises anything up to 30 spins, and players can choose between two free spin modes, with each one influencing a player’s bonus differently. The Primal Rage Spins feature promises a wild symbol on each spin. This wild can then work its way across the reels in a similar fashion to the Rampage Bonus. Alternatively, players may opt to play with the Wild Hunt feature, which offers multiplier wilds on each spin. Those multipliers could be worth up to 3x the standard rate of pay in all. 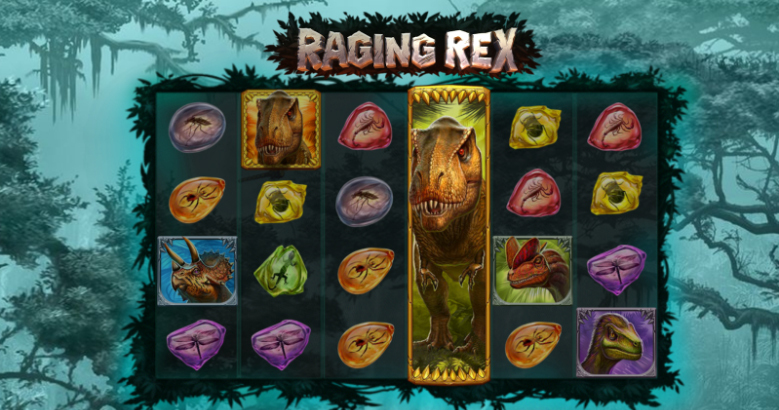 It isn’t the just the Raging Rex slot which is set to debut this year. Play ‘n Go promises their fans a total of at least 40 new titles in 2019. Now that the first one is out at sites, their attention focuses on the next. Before the end of the month, the 3-reel classic slot, Queens Day Tilt will also be making its debut at leading Play ‘n Go casinos.